This is so funny! 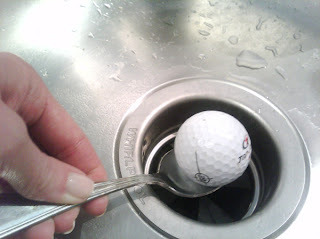 So something that could happen to my sink, especially with golf season upon us. ha. Glad your sink is ok though! How is your new home? Do you feel settled yet? We love our new home! We just got the living room furniture arranged the other night and hung the drapes so it feels like home! (Though there are still nice little piles of bags and boxes just waiting for me to sort through). It's so much more suburban than the last place we lived and I just love that about it! You and Jeff are moving in the next few months, right?